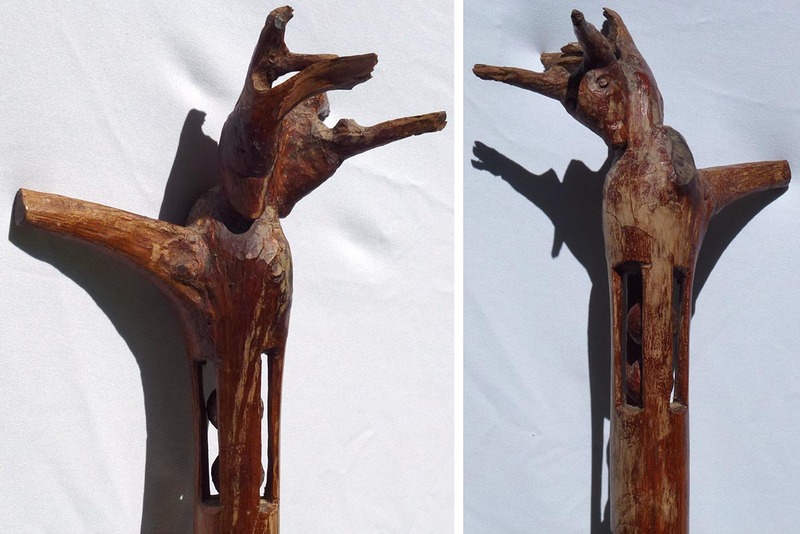 Canes at Artisans Folk art, antiques, and outsider art Gallery. CALL 256-886-2809. Click on a photo for details Use the 4 letter code when referring to items. 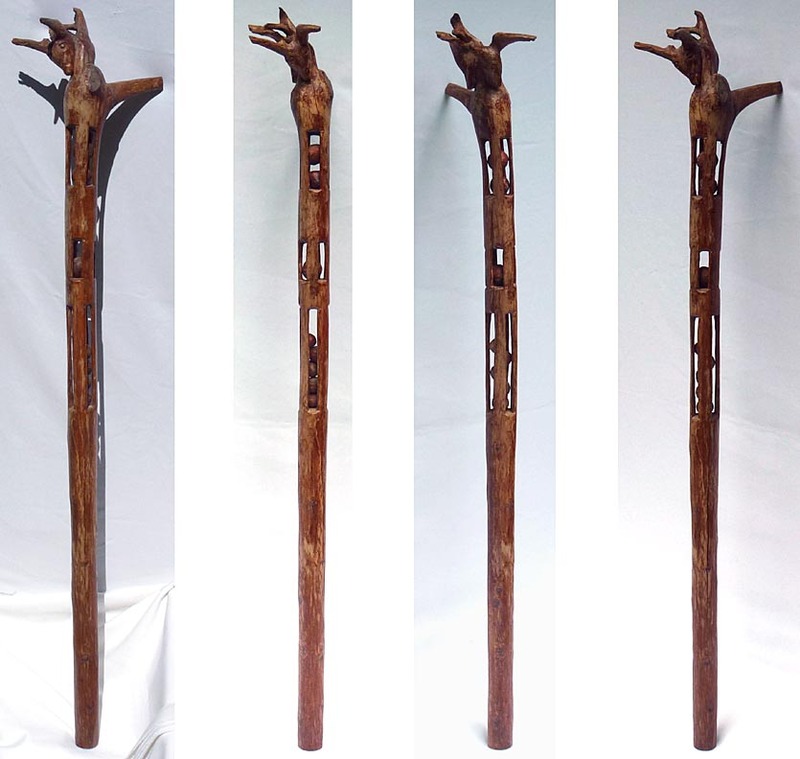 This is a large staff with two carved animal heads at the top and three sections of whimsy carved captured balls in cages. 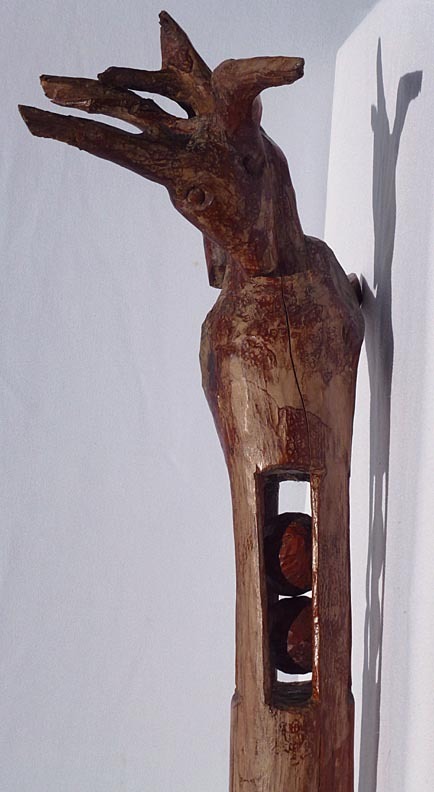 The piece is about 58" high with a 2" diameter for the shaft. 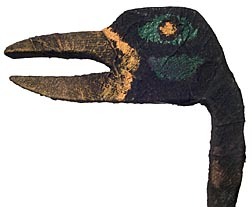 The top section was likely the roots and is how it grew, which left places for stylized faces and horns. 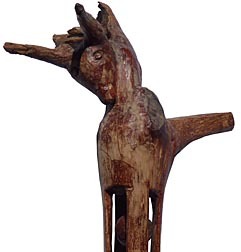 Eyes are carved in one of the faces. In the sections of cages, from top to bottom, are 2, 1, and 5 crudely carved balls that are free to move. 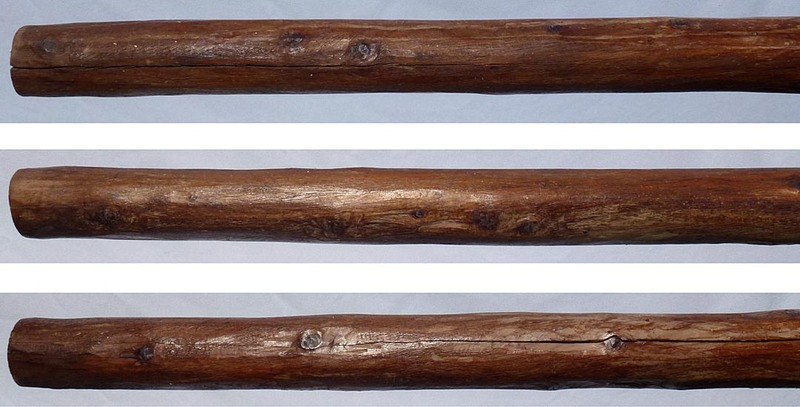 The staff is made from a piece of hard pine. 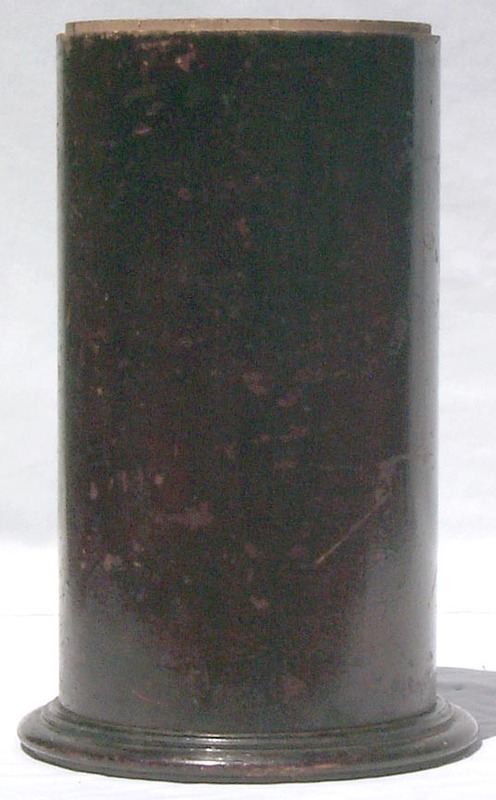 It is finished with varnish, much of which has worn, with some turning lighter. The condition is good, with the worn varnish and some age splits. The age is unknown. The price is $425.00. Inventory Code: TRSH. See a slideshow of several views [727k] ... Whimsy carved staff ... Closeup of the top ... Two more closeups of the top ... More closeups ... Other angles ... Two more closeups ... Closeup of the caged balls ... More closeups of the middle section ... Closeups of the bottom end ... Closeup from above ... From above and below ... With a yardstick for scale. Some much larger photos: Whimsy carved staff ... Closeup of the top ... Two more closeups of the top ... More closeups ... Other angles ... Two more closeups ... Closeup of the caged balls ... More closeups of the middle section ... Closeups of the bottom end ... Closeup from above ... From above and below ... With a yardstick for scale. 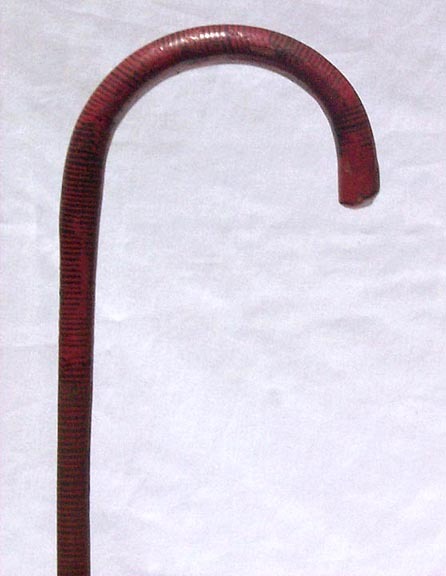 NOTE: The canes below came from the collection of Herbert Hemphill, the noted folk art collector. 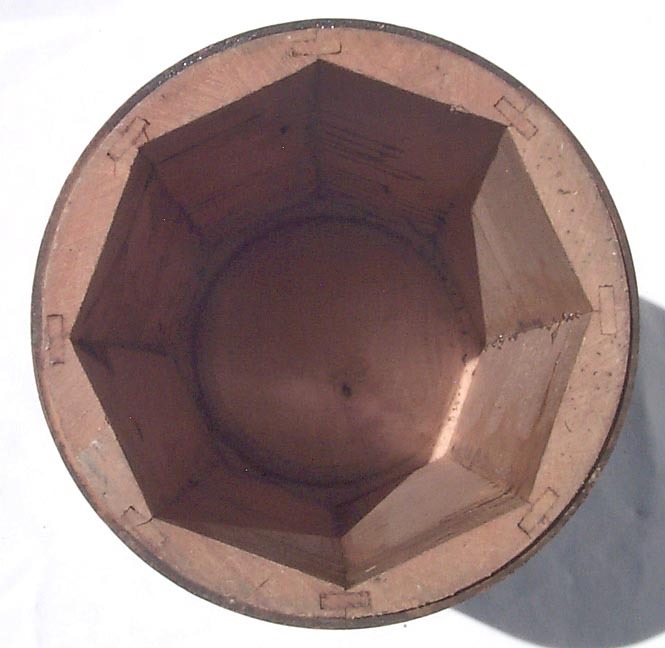 This is an old, circular, wooden cane holder or umbrella stand. 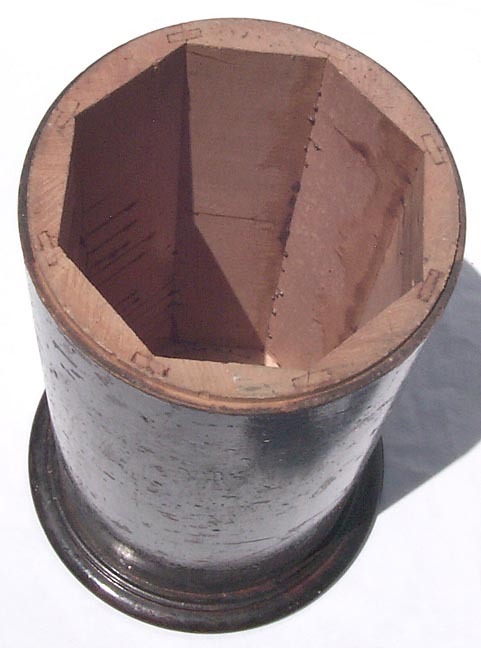 It was made as an octagon from 8 pieces of hardwood pieced and mortised together which were then turned on a lathe so it is round on the outside. It was then fixed to a turned base. 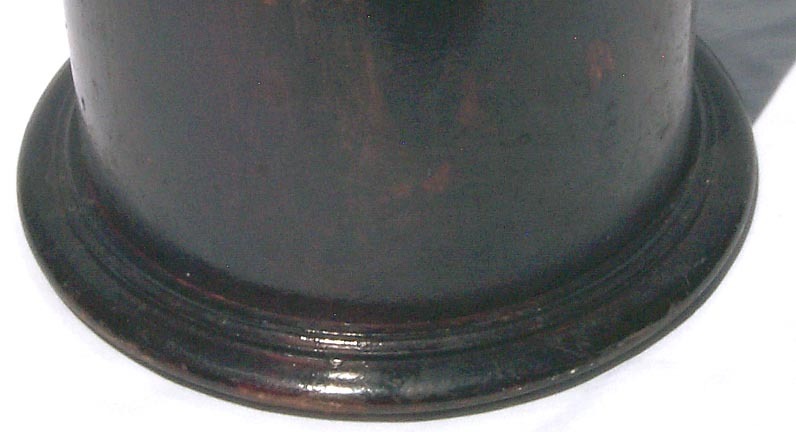 All of this was finished with a very dark varnish, which has darkened more with age. 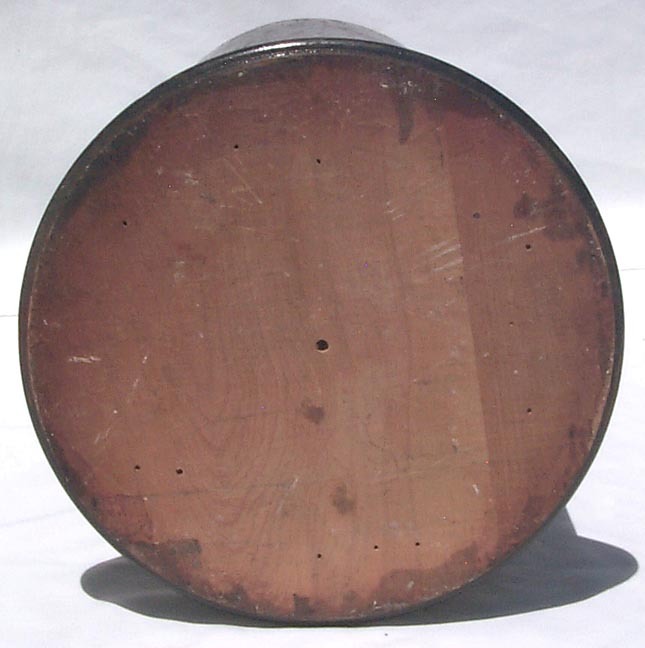 This piece is in very good condition with some wear in the varnish, and stands 19" high with and outer diameter of 10" on top and 12" across the base. The opening is about 8". The price is $85.00. Inventory Code: ARPT. 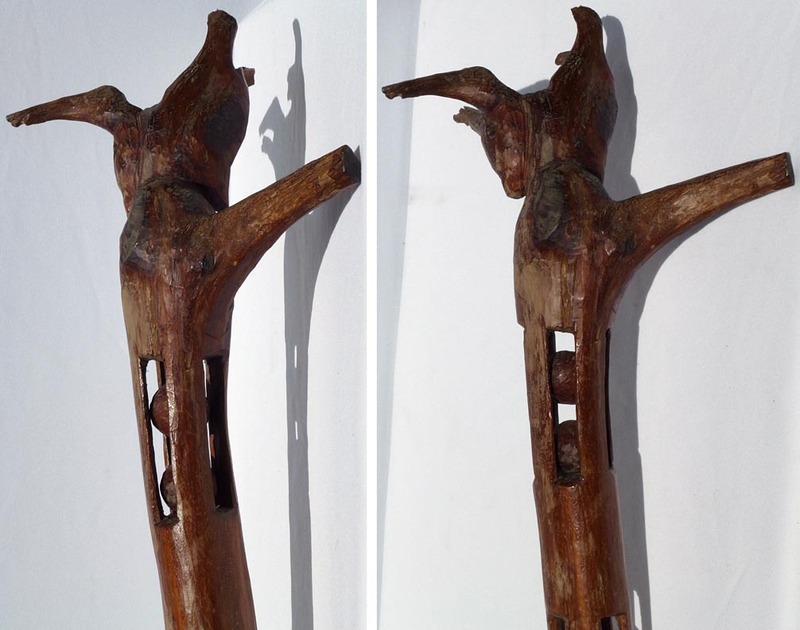 Wooden cane holder ... The other side ... From above ... Closeup of base ... Another angle ... Bottom. 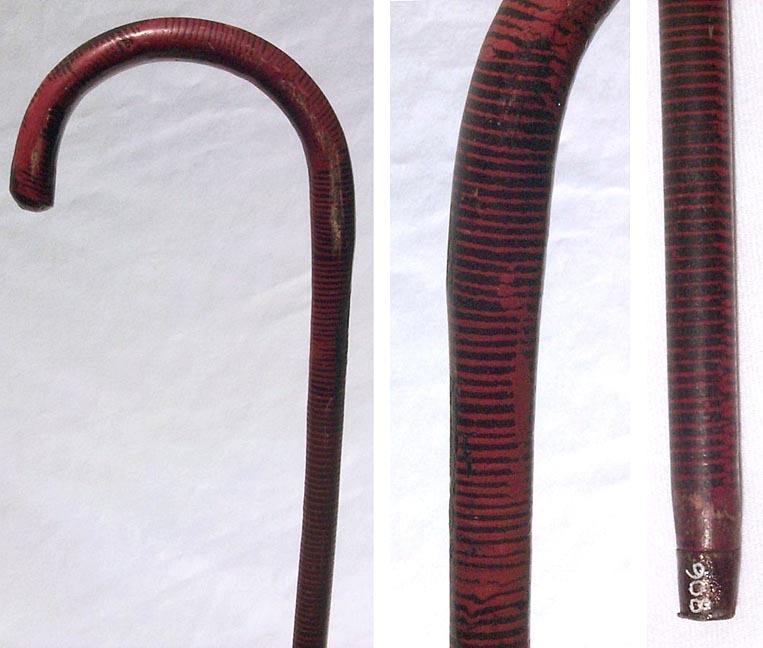 Here is a nice, simple, attractive hand carved cane which was then painted a deep reddish brown with fine black striping. It has a metal ferrule on the tip with the number 908 painted on in white. It has been used, but is in very good, sturdy condition with only a little wear. 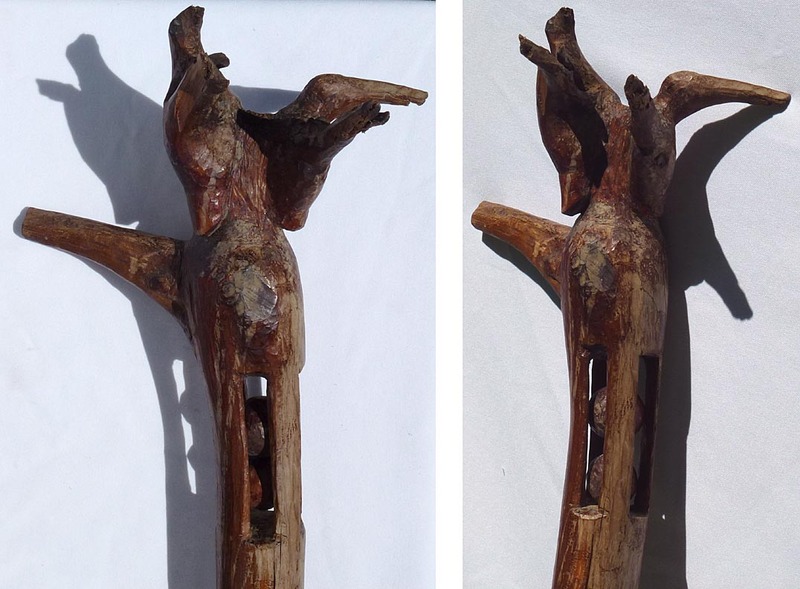 It seems to be about 60 or 70 years old, and is 35" long. The price is $55.00. Inventory Code: ARPC. 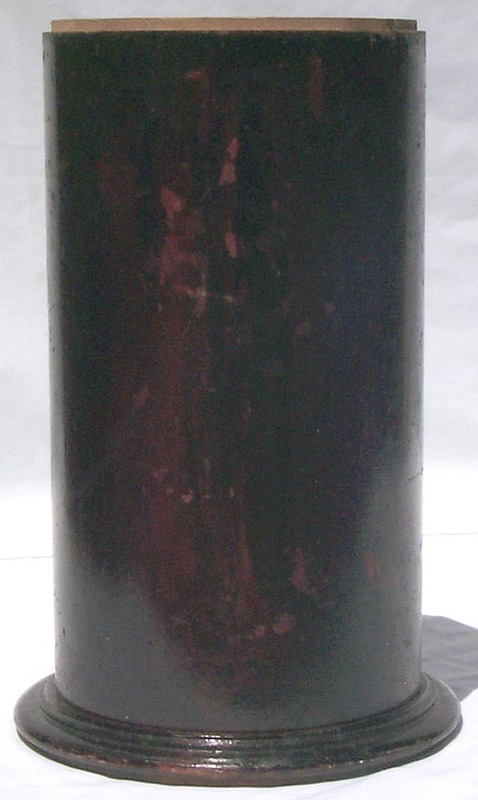 Carved, painted cane ... Closeups of detail ... Other side of top. 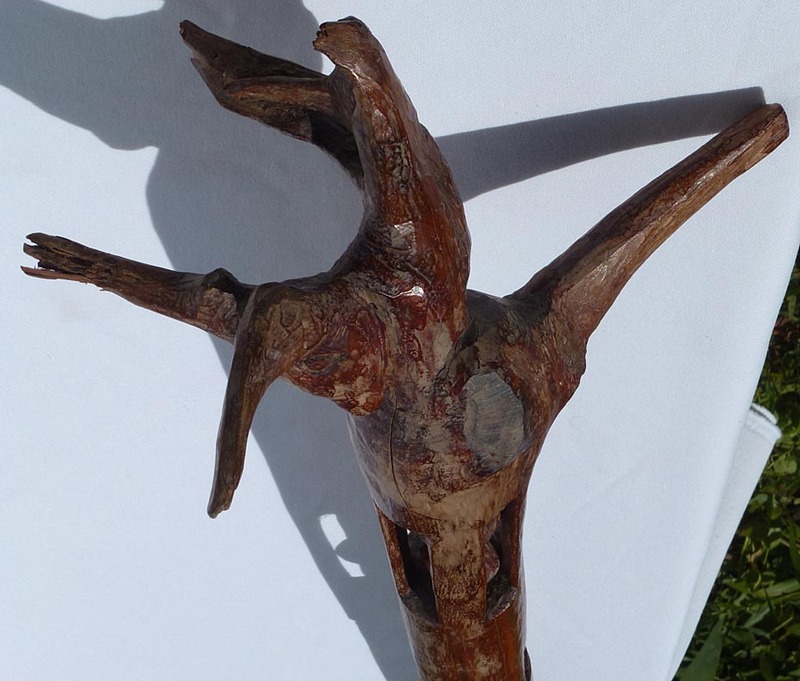 This is a weird little cane carved like a bird with a long neck and foot. 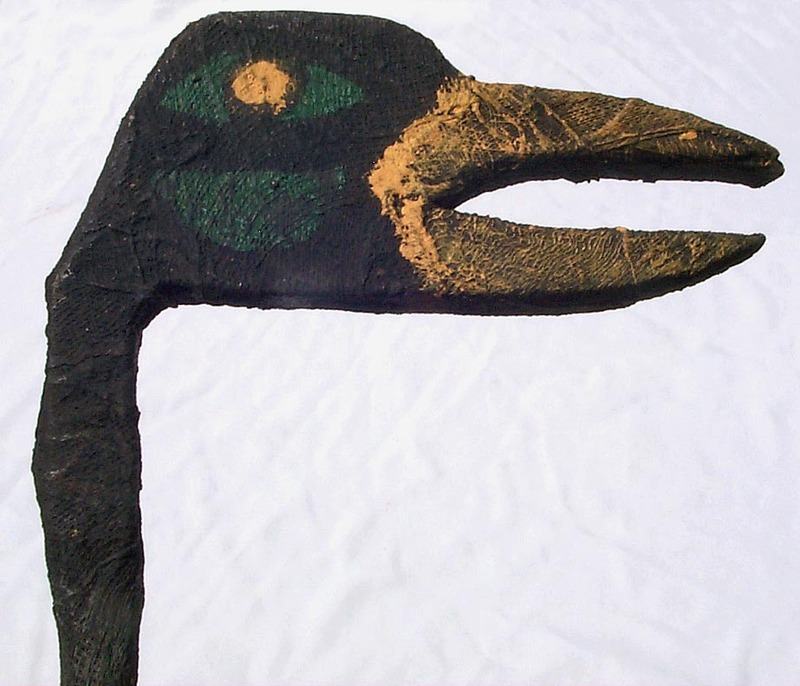 It is made from wood and has been covered with something like hardened cheesecloth which has then been painted. 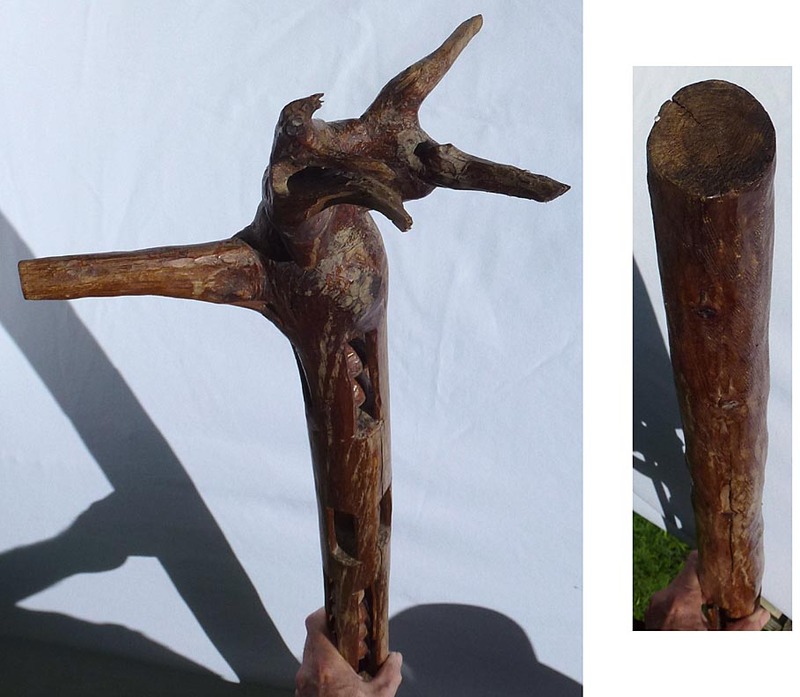 This seems to be unused as a walking stick, and is really more of a decorative piece. It is not new, but probably not too old - maybe 1970's or so? 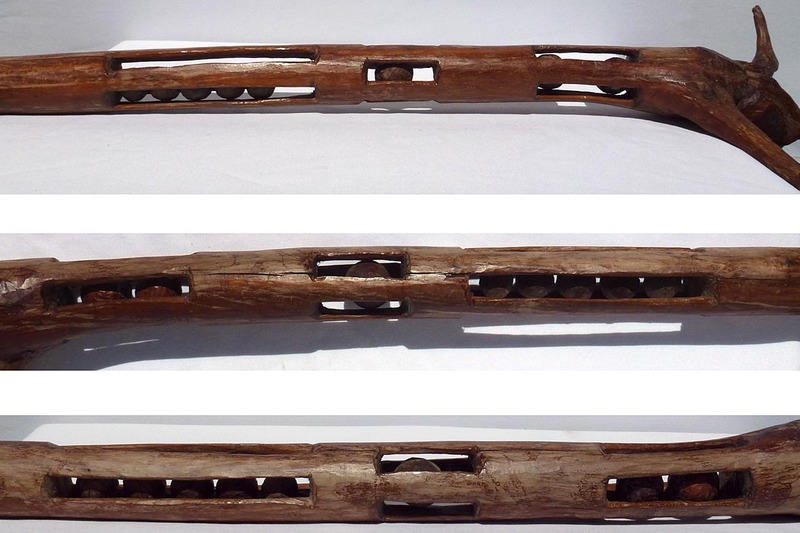 It has nice texture, form and color, and is almost 27" long. The price is $75.00. Inventory Code: ARAA. 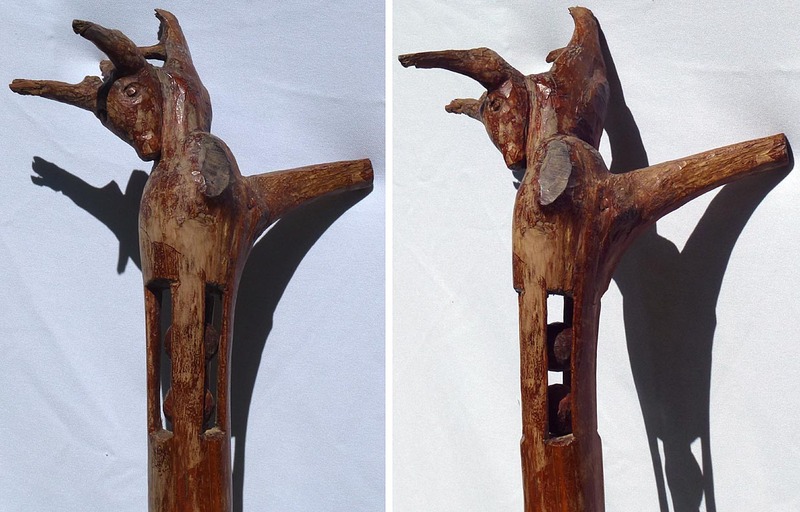 Cane carved with bird head and foot ... Closeup of head ... Closeup other side. When we add any antiques or folk art to the site. This will include Canes and Walking Sticks.